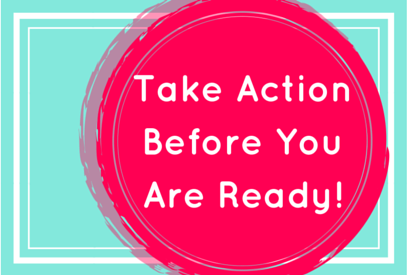 If you wait until tomorrow to take action or when you are ready, then bad news…your business will not get very far. Even when it’s uncomfortable, you have to start taking action now! If you don’t grow then your business doesn’t grow. That’s why it’s so important to constantly step outside of your comfort zone. Now I’m not suggestion you do something drastic, but just try one thing and do it, even if it scares you a little. For example, I recently been doing more videos for my business. I am by no means a pro, but I’m getting better and better at it. Now I can do one or two takes vs the 10 I was doing before. As my mentor always says, “Fail Forward”. You’ll learn more about yourself and your business if you try and fail. 1. Write a list of actions that you know you need to take, but for some reason you are scared to take or have procrastinated. 2. Next to each item you listed, write down the date when you will complete the task. 3. Now hold yourself accountable. There are various ways to do this if you are like me and tend to need a little incentive. You could put a dollar in a jar for every deadline you miss. You could ask a mastermind partner to hold you accountable. You could schedule it into your calendar so you don’t forget to do it. You could post it below in the comments so everyone can see what you are doing and the deadline. It doesn’t matter how you hold yourself accountable, but you need to make sure you treat the deadline as a non-negotiable. Share your top 3 action items and deadlines in the comment section below. And if doing a video is one of your action items, head over to the Brand Fame Mastermind Group on Facebook as we are doing weekly video challenges.